GreenForce-Player is another interesting alternative to the multimedia players we already know. This open source player allows you to play a large amount of formats, it has a simple and clear interface, and as a more interesting innovation, allows you to protect your videos with DRM. If you are looking for a lightweight and easy-to-use player, GreenForce-Player has all these features, and furthermore, it's free. One of the most noteworthy features of GreenForce-Player is that it can encrypt both video and audio, by means of the same application. Thus, the videos will only be able to be played by means of the pre-established password. To do so, GreenForce-Player creates its container format and encrypts it. Thus, you will be able to protect those videos that you don't want anyone to see. Supports that majority of current formats. Has support to play videos via streaming. Doesn't require administrator privileges to be installed and launched. 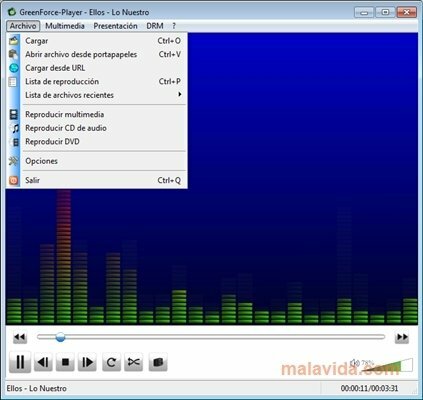 GreenForce-Player is an ideal tool to play videos on your computer. A simple, free and comfortable player. Don't think twice and download GreenForce-Player.